In the corporate world and the investment community, progress is increase in stock value of the company. 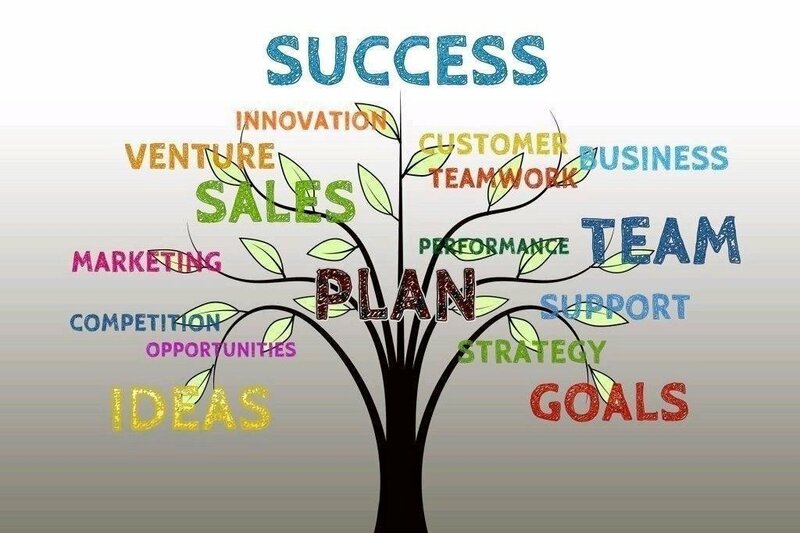 The dominant measure of success is an increase in the valuation of the company and everything revolves around this measure. Corporate business accounting has well defined ways of computing profit for business. This definition of profit by Lord Benson over 60 years ago is very simple! This definition is one of the most elegant definitions about anything anywhere. It is such a contrast to the way profit gets defined in law and regulation … such as the FASB standards and IASB standards, where different rules can be applied in a variety of different circumstances, and in the end, there is no certainty about anything. In this last case the value is the less at the end of a period than at the beginning of the period ... a problem because activities produce less than are consumed. Progress is the amount by which the VALUE at the end of the period (EOP) is more than the value at the beginning of the period (BOP) The import think to note is that progress can be measured in this situation without needing to know anything about the activities during the period. Instead of thinking about STATE as a single capital, STATE is the totality of ALL the capitals. This image was created several years ago relatively early in the development of TVM. The core concept remains the same, though the naming has been changed so as to conform more with other initiatives. Progress is incremental value … that is improved quality of life … improved social value that makes quality of life better. Socio-economic value progress is one of the core metrics for a smart society … yet almost absent from the money related metrics used by the corporate community, capital markets and the broader society at the present time. TVM has a community focus treating the community as the reporting entity. The rules for consolidating accounts apply as all the subsidiary units doing economic activities in the community are brought into account. TVM includes transactions that reflect value as well as the normal money transactions. 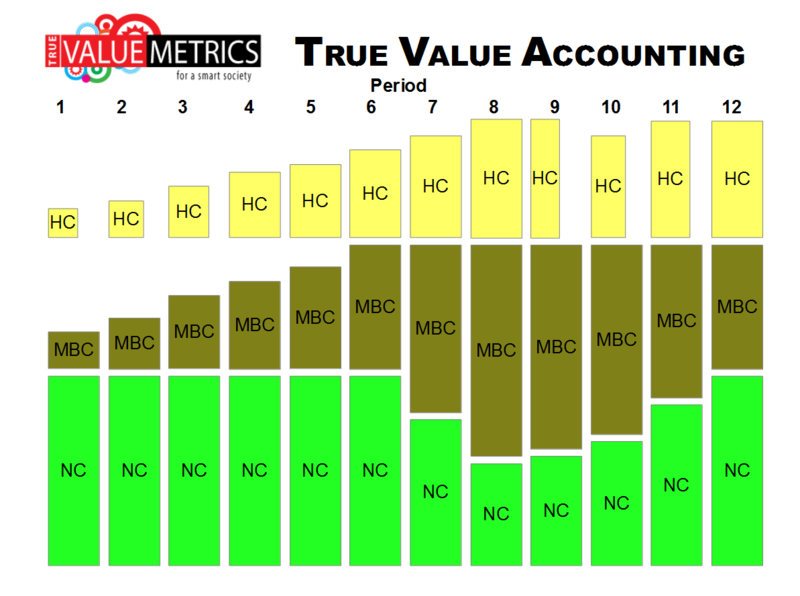 TVM is more accountancy than a statistical construct. The data are as simple as possible ... the transactions as small as possible, as many as possible and as clear as possible. 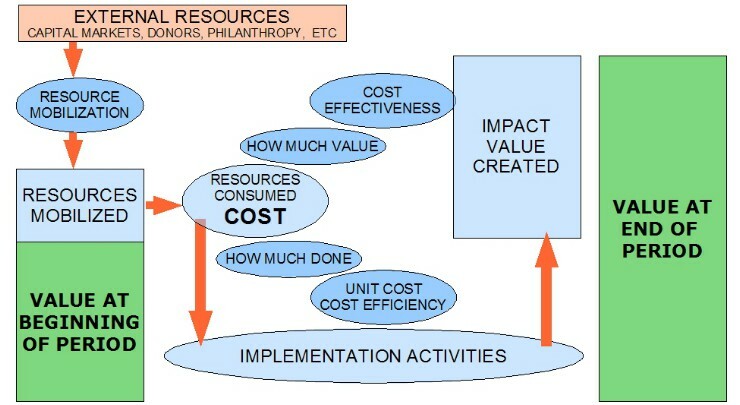 Some of the value of TVM derives from how TVM can do accounting for community progress. In the following graphic ... the value of the community at the beginning of the period is the same as it is at the end of the period ... the community has gone about its business for the period, the time has gone by, but nothing has changed. Data about the daily activities is not needed in the TVM system in order to be very clear about progress ... whether it is progress or problem. All that is needed is data about the value changes that have taken place from the beginning of the period to the end of the period as shown below. 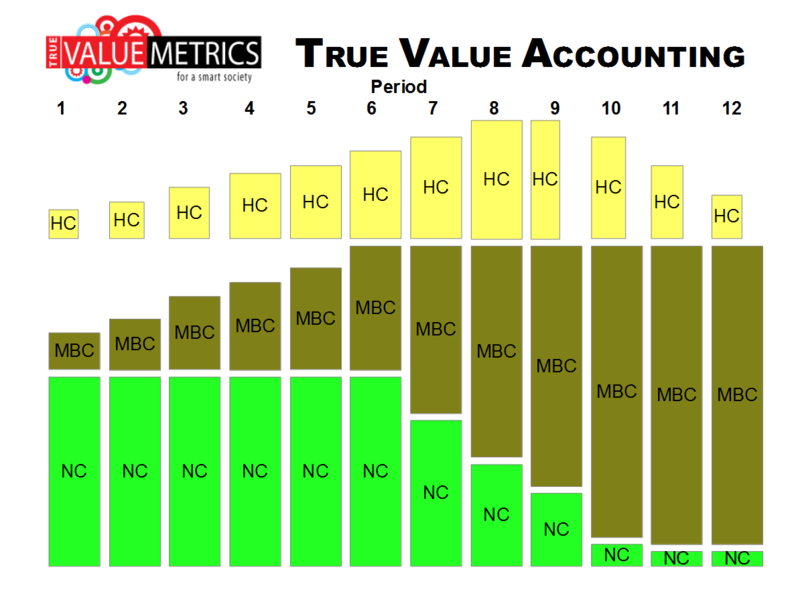 The three key datapoints in TVM are cost, price and value. Value is the key datapoint in measuring progress or problem. Cost is a function of and derivative of productivity and important in the analysis of activities. Price is important in money accounting and how value creation is allocated to different groups. Value is important, but it is also a complex datapoint because there are many different views for any specific element of value. This has been embraced for some years now by capital markets as they have created more and more complex financial instruments ... maybe not all of them proving to have substance ... but the basic idea also works for TVM value. In the case of TVM there are a combination of standards drawn from various disciplines including conventional financial accounting. 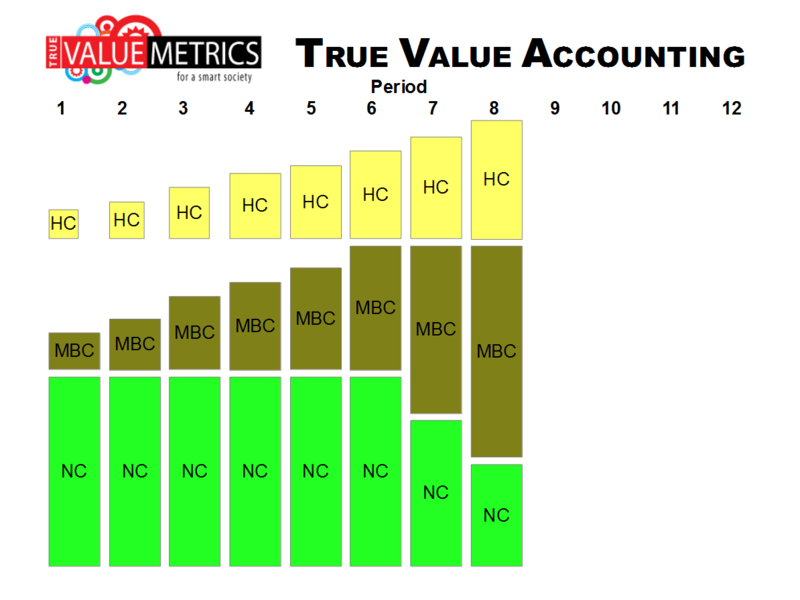 TVM refers to the unit of account as SVUs ... Standard Value Units. More than anything else TVM is designed to be very practical, very simple, very low cost and very effective. This idea has been articulated in many different ways, including in the writings of people like Adam Smith and John Stuart Mill, but the world has changed a lot since their ideas were formulated. 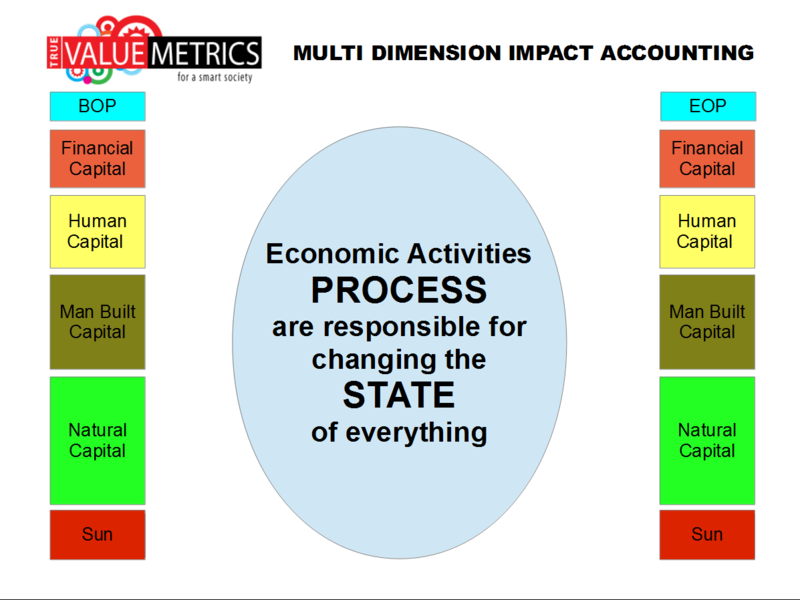 Without an effective alternative system for the measurement of performance, using money metrics, wealth and profit performance will show the capitalist market system to be “the best there is” … but, based on true value metrics (TVM) it becomes abundantly clear that something very much better is possible. Simply put ... better metrics requires that impact on ALL the CAPITALS is taken into consideration in the analysis of every ACTOR in the complex socio-enviro-economic system. Since the emergence of modern capitalism the primary goal of entrepreneurship and investment activity has been to increase financial wealth using 'Land, Labor and (financial) Capital', that is the classical 'Factors of Production'. The main metrics for this system have been business profits computed using conventional double entry financial accounting and wealth measures correlated with stock market prices, and perhaps to a lesser extent prices in other markets like the commodity markets, housing markets, etc. Winning the Game! But what Game? ... More and more … of what? So much of modern progress has merely been doing more and more of what, arguable, the world neither wants or needs. A huge effort has been expended in trying to create wants and needs … for not good reason. The measures (metrics) for corporate profits and many related metrics about economic performance like GDP growth are computed all the time and reported frequently. Compared to this reporting there is nothing like it for the progress and performance of SOCIETY or the ENVIRONMENT. It is not surprising that there is an almost total focus on maximizing profit perfornabce and financial wealth creation and virtually nothing to ensure social progress and the minimum of environmental damage. The world has achieved an amazing capacity to produce … something never achieved before at any time in human history, but the metrics about socio-economics are pushing for production of all the wrong things … essentially for things that produce the most profit. Prevailing metrics give no encouragement for those initiatives that would help satisfy important needs and be very valuable without being profitable. As long as the present dysfunctional metrics continue, ACTORS will make decisions that are terribly dangerous for the future of humankind and the planet. Much of the fabulous human progress made in the past 200 years has come at the expense of the environment. The measures have been powerful for everything to do with financial capital and wealth, but the related value destruction of NATURAL CAPITAL has been totally ignored until quite recently. There is now an increasing amount of talk about sustainability, but so far no widely accepted system for numbering social and environmental performance. TVM thinks of progress as winning the game … and maximizing quality of life. This is not a money construct but a value construct and way more complete as a system of metrics than mere money and money accounting that has changed rather little since it was devised in its modern form some 400 years ago. In TVM, progress … maximizing the quality of life … has a central role, just as profit has a central role in the business entity and the money metrics of capital markets. There are many intangible activities that can change the value balance sheet of an entity … and change can be significant and happen rapidly. Security changes intangible values a lot … the value of security is high based on all the economic opportunity that exists when there is security compared to when there is not. People need security in order to go about their daily lives and engage in socio-economic activities. A high crime neighborhood is associated with a poor quality of life! Remove the crime and the quality of life for everyone in the community improves. The “value” of a person is diminished when there are no job opportunities where a person may used their skills. Quality of life goes up when people have opportunities to use the skills that have been God given or acquired by hard work and diligence. A place may have people and resources but nothing gets done and there is no progress when the right organizations do not exist. Without a capacity for organization very little gets done. Putting in place an framework of organization adds value to the community and enables resources to be used effectively to create the value for progress. How do Heads of State become billionaires? There is something very wrong with a socio-economic system where Heads of State in countries that are resource rich become money billionaires while the population of their countries remain in a chronic condition of poverty. This reflects decision making metrics that are money profit weighted with little or no attention to social values … or indeed basic moral values! If the game is better and better quality of life … then the metrics of performance should have a focus on this. Better and better quality of life is the way this game needs to be scored, and the way the game is played. The “stats” should be all in support of this game. This is about social value as well as about business profit … it is about values in society as well as money and material wealth. The conventional wisdom in recent times has been that a company exists to make profit for the investors. This is convenient for investors and owners, but everyone else is ignored and in the end the singular focus on investors is unsustainable. Business organizations are very important because they dominate the economic dimension of the socio-enviro-economic system and it is their performance that will determine progress in both the social and environmental dimensions of the system. The not-for-profit organization depends for its survival on the availability of external money to sustain its work. This work may be very important, but in the prevailing conventional socio-enviro-economic system it has no inbuilt economic sustainability even though its work may have social value and environmental value. The socio-enviro-economic system will do best when PEOPLE are the priority both as beneficiaries and as contributors and also as decision makers. In the end people make all the decisions and the system should enable people to make good decisions both for themselves and for everyone else. The characteristics of a PLACE have a major impact on people and their quality of life. People and organizations can move, but a place is permanent. People live in a place and it is in the place that everything must come together. A community is an instance of a place. A community has a human scale while a place may be much larger incorporating multiple communities. Products are important and the foundation for the material dimension of human quality of life. There are major differences between societies where shortage prevails and where there is abundance or surplus. There are no economic limits to how much can be produced, but there are serious limits imposed by natural systems which until recently have been ignored. In the end, efficient consumption of producxts is essential. In many organizations (like the World Bank, the UN and Governments) the program or project is the implementing entity. They have a major weakness in that mostly they are time limited and disappear at completion. As they disappear, any ability to have accountability disappears as well. Very convenient but a big reason why many programs and projects do not perform. It is a poor representation of what has to happen for an individual or an organization to achieve success.